It is now possible for computers to reconstruct the DNA of the ancestor common to all placental mammals, including humans. 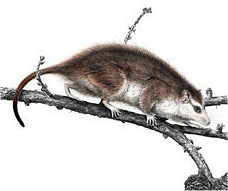 In research published in the December 1 issue of Genome Research, a team led by David Haussler has reproduced part of the genome of this small, furry nocturnal animal that lived more than 75 million years ago, at the time of the dinosaurs. This genome reconstruction promises a better understanding of the evolution of humans and other mammals at the molecular level. Haussler and Mathieu Blanchette, a postdoctoral researcher at UCSC who is now at McGill University, teamed up with Eric Green, scientific director at the National Human Genome Research Institute (NHGRI) and director of the NIH Intramural Sequencing Center, and Webb Miller, professor of biology and computer science and engineering at Pennsylvania State University, to look at the possibility of reconstructing the ancestral mammalian genome. For this project, Blanchette developed a massive software program to simulate all the known processes that modify DNA as it evolves. The researchers then focused on a small region of the genome called the CFTR locus, which includes the gene involved in cystic fibrosis. This region--encompassing ten genes and adjacent stretches of DNA, for a total of more than one million base pairs or "letters" of genetic code--had been completely sequenced in many different mammals. Comparing the simulated evolution process with actual genomes of 19 existing species showed that the process works, yielding 98 percent agreement. Haussler said he hopes these findings will encourage the additional genome sequencing that would be needed to do a complete reconstruction of the ancestral mammalian genome.